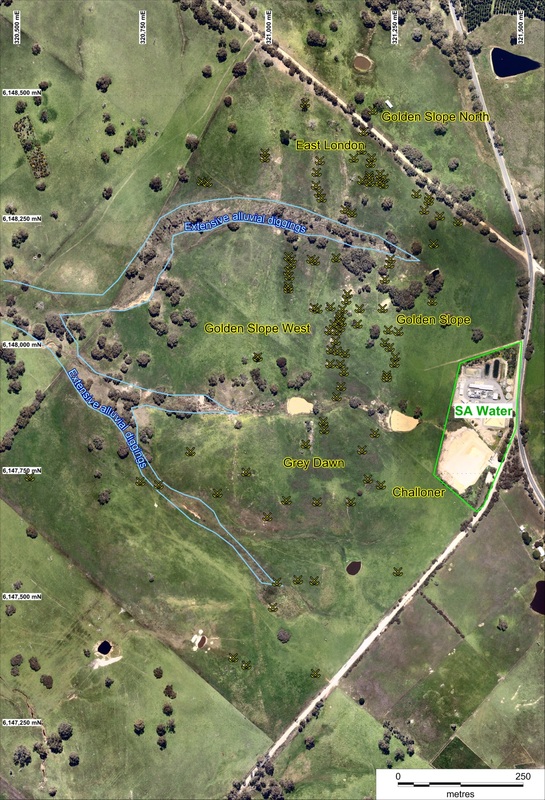 The Golden Slope project falls within the eastern portion of the Birdwood Goldfield and is located on EL5568 approximately 40km ENE of Adelaide. Alluvial gold was discovered at Golden Slope in 1869 and by 1870 over 2,000 ounces of gold had been recovered. Sporadic workings of the alluvials from 1870 to 1933 produced an additional 2,000 ounces bringing the total alluvial production to 4,000 ounces of gold. 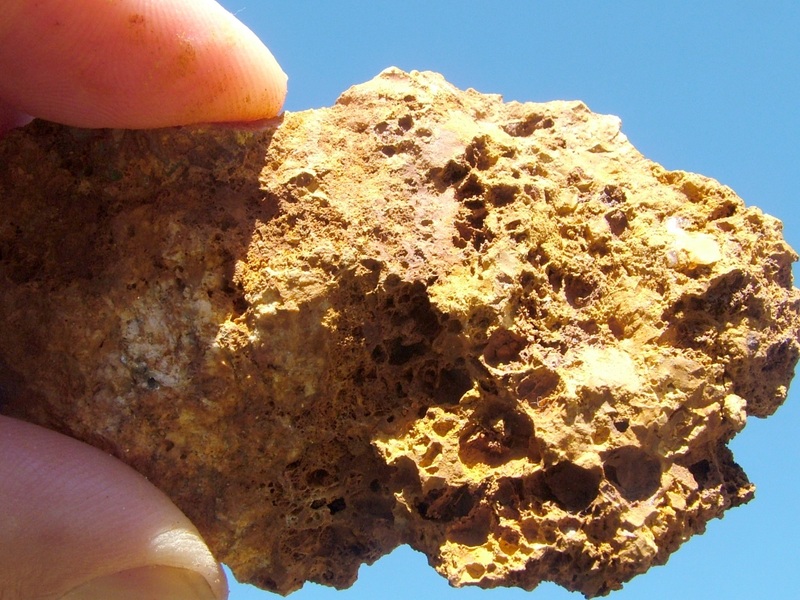 The first gold bearing quartz reef was discovered in 1871 was worked by the Mt. Pleasant Gold Reefing Company who sunk an engine shaft and erected a puddling machine and a traction locomotive for ore treatment, work ceased in 1872. Mining recommenced in 1893 with DMITRE records showing that within a few years 14 mines were operating but the field was eventually consolidated by the Golden Slope West Co. who worked the field up to 1902. Production figures from the mines are incomplete but typical recorded grades for the ore processed are in excess of an ounce of gold per tonne. From aerial photographs over 100 workings (shafts, prospecting pits and costeans) can be identified spread over an area of 1100m by 500m (Figure 5) but little information has been found to date to accurately determine which workings belonged to which mine/company. The most productive workings were stopped by the inflow of groundwater. The deepest recorded stoping was at Golden Slope West where at a depth of 50m the inflow into the mine is documented at 3,000 litres per hour. 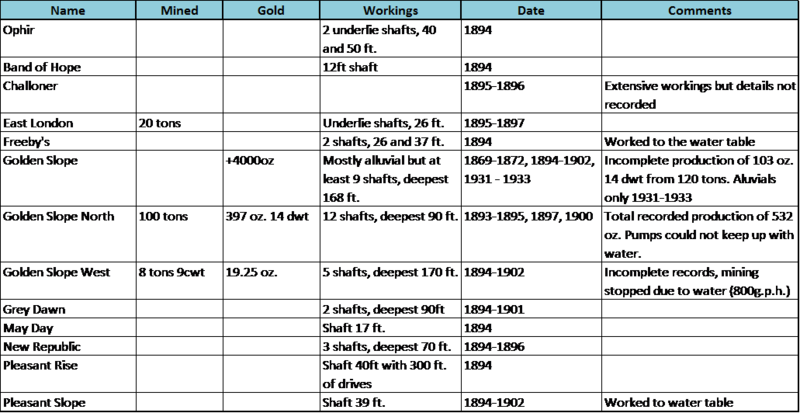 Table 3: Summary of historical mining at Golden Slope. Prior to Terramin’s entry onto the property no modern exploration had been undertaken. Terramin has commenced rock chip and soil sampling as part of an orientation survey to assist in targeting planned drilling. At surface various styles of quartz veining styles are present ranging from flat lying sheeted veins within altered granites, sub vertical sulphide rich quartz veins (Figure 6) and quartz stockwork veining within quartzite and dolerite. Historic records (H. Brown, 1908, Record of the Mines of South Australia) describe the Golden Slope West mineralisation as a “reef, 6ft. wide, of soft friable material, containing a large percentage of pyrites carrying free gold”. In the same document the Golden Slope mineralisation is recorded as being contained in three parallel lodes “The first is 3ft. wide, contains veins of quartz, gossan and slate highly mineralized; the second consists of micaceous quartz, gossan and micaceous schist; the third, which is 7ft. wide, contains veins of quartz, clay stone and decomposed granite, strongly associated with oxide of iron”. Terramin considers the Golden Slope area highly prospective for the discovery of high grade gold mineralisation and is in the process of gaining the required permissions (government and landholder) to explore beneath the historic workings. Figure 5: Location of historic workings at Golden Slope.